parks in the city, as well as fun museums like ROBOSQUARE where visitors can play with and build different types of robots. In general, Fukuoka is a great place to experience a typical Japanese lifestyle, as residents are very friendly and the city is extremely safe. I have been to Fukuoka Hakata. I ate Hakata ramen there. The biggest, most modern city on the southern island of Kyushu has an international flavor, with ferries zipping back and forth to Korea and a surprising number of international university students. The city still has plenty of Japanese traditional appeal too, including world-famous Hakata-style ramen. It's also a great jumping off point for exploring the rest of the island, whether you're headed to the hot springs of Beppu and Yufuin, volcanic Mt Aso or the southern castle city of Kagoshima. Beyond the industrial areas, much of Fukuoaka has a rural aspect to it yet also easy access to the sea. Had a wonderful experience staying in a Japanese ryokan style traditional inn. Also had a wonderful seafood meal at a local restaurant. Had the feeling that few foreign tourists make it here other than occassional business travellers checking in on factory operations. Though it can feel gray and industrial, central Fukuoka has its charms. The highlight for me is late night ramen at one of the riverside stalls. The people are friendly and the nightlife can be fun if you are gregarious and don't mind striking up conversation at one of the many small bars. Famous for tonkotsu (pork bone) ramen. Fukuoka is a laid back town on a sea side. There's something unique about the cities near the ocean and Fukuoka is one of them. There are a lot of budget hotels to stay near the city square. Many options for the ferry boat if you want to travel other parts of the country by ferry boat! Fukuoka is a pleasant coastal city worth a night's stop on a Kyushu itinerary. It is laid-back and has a vibrant nightlife. 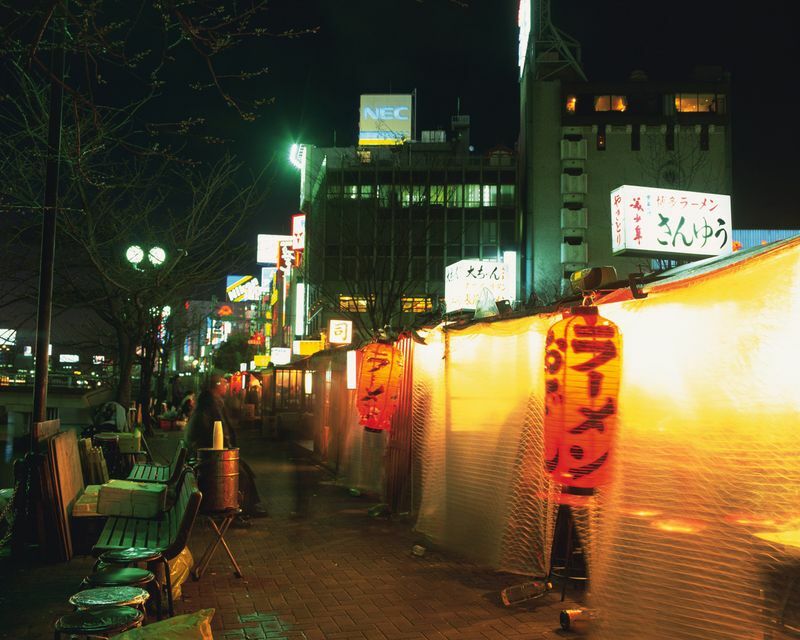 Ordering a bowl of ramen in the "yatai" street stalls is the city's highlight. Thank you to Masako San... I do miss you and your family all of the time.. It was nice trip even a bit sad for me but when I looked at the photos ... I would like to say thank you to you and your brother until today!! Known primarily for its beachside location, local variety of ramen, and its status as a destination for 24-hour party people, Fukuoka is merely okay. The beaches, while pretty, are nothing special, and the city center has little in my experience to differentiate it from any of a dozen other Japanese big cities. The rich, fatty tonkatsu ramen, however, really IS exceptional - a visit to the 'ramen street' stalls in the evening is pretty great if you find yourself in town.